In the era before smartphones became a viable games platform, a glut of poorly received software featuring licensed characters flooded consoles. For example, the atrocious Nicktoons racing trilogy of Nicktoons Racing, Nicktoons Winner's Cup Racing, and Nicktoons Nitro. But with mobile games now being a popular children's entertainment staple, who would be crazy enough to return licensed games to consoles? Publisher GameMill Entertainment and developer Bamtang have announced Nickelodeon Kart Racers for the PlayStation 4, Xbox One, and PC. 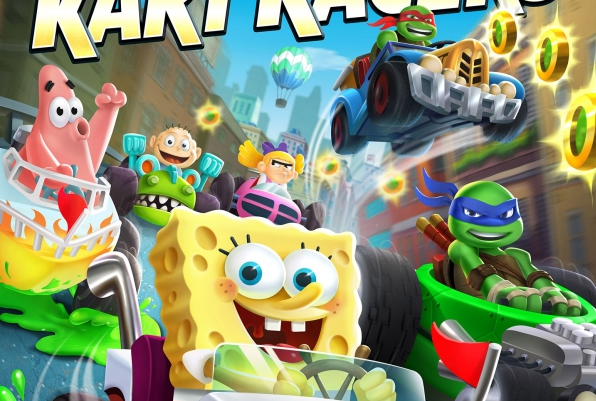 Popular characters Tommy Pickles, Arnold, Spongebob Squarepants, and the Teenage Mutant Ninja Turtles will race to the finish line in 24 separate tracks. In another throwback, up to four players will be able to engage in local races and battles when Kart Racers launches on October 23. Though many of these franchises haven't been seen since the early 2000s, this follows a series of recent Nicktoons revival projects. Last fall, Nickelodeon premiered a new Hey Arnold! movie, serving as the series finale 13 years after it's final episode. This year will see the debut of a Rocko's Modern Life tv movie, with 26 new episodes of Rugrats planned for 2020 alongside a CGI theatrical movie.